Hawgleg Announces a SWEET New Game Release! Hawgleg Publishing is thrilled and delighted (heck, we’re so giddy that we’re tempted to make up the word thrillighted) to announce that we’ve come up with what is sure to be THE NEXT BIG THING in miniatures gaming: Milk Chocolate Miniatures and Dice! The edible gaming bits will be the centerpiece of a paradigm-shifting game release that combines the yummy goodness of chocolate with the Origins Award winning rules of Gutshot. The new line will be called CHOCOSHOT. 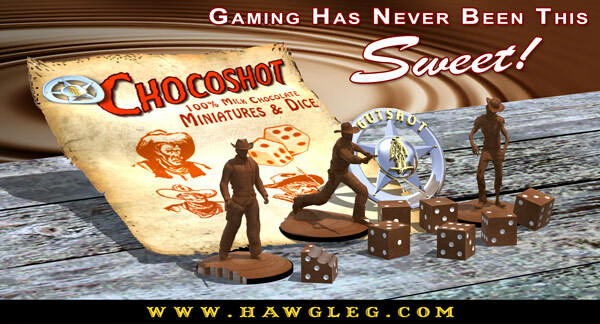 "Chocoshot is more than just Gutshot with yummy bits," said Hawgleg co-founder Mike Mitchell. "This is an exciting new game that restructures everything from the ground up." To show damage sustained by a miniature during the game, you actually bite off that part of the figure. In campaign games, Gutshot’s “Victory Point” system (which is used to level-up and buy new abilities) has been replaced by counting calories. Unlike real life and your waistline, the more calories you consume, the better your character plays the game. We also include a new set of “sugar high” abilities, like faster movement, super-quick draw, and a critical "sugar crash" table for when you roll Snake-Eyes (or when a player enters hypoglycemic shock). Our Zombie figures have cream-filled brains to clearly indicate successful head shots. And don’t fret about replayability: Each miniature will be sold in a six-pack, so you’ll get six duplicates of the same figure to represent how he “heals up” between games. Speaking of figure availability, for those of you who like to play more than one character, we’ve got a Whitman Sampler pack that comes with 24 different miniatures (and don’t worry yer head none – we ain’t gonna put any of that yucky nougat filling in them). Additionally, figures will be available in two scales: Standard 28mm and Super-Sized 54mm (the latter of which is NOT recommended for diabetics). “Since these are chocolate, your girlfriend might actually want to play this game,” said Gutshot co-founder Mike Murphy. Do not leave your minis in a hot car between games. We are not responsible if your Gunfighter turns into a pool of goo. Absolutely no dogs allowed near the gaming table. Do not game with chocohaulics, as they tend to play kamikaze characters so they can eat their figures. Hawgleg Publishing is not responsible for broken teeth and dental trauma from you confusing our chocolate figures with your standard lead minis. Hawgleg is not responsible for broken chairs, popped buttons, belts, or zits incurred from playing this game. Additionally, Hawgleg is not responsible if you actually send us any money to buy this product, because it is an April Fool's joke! Have a great day, and may all your hits be crits!